A paper presented at the Burns in the Scottish Diaspora Conference, Napier University, Edinburgh, July 2009 and at the 2009 Scottish Studies Fall Colloquium, University of Guelph, September 2009. Figure 1. Montreal Daily Star, 20 October 1930, page 3. On a cold and rainy October day in 1930, Montreal’s Scottish community unveiled a statue of Robert Burns in the city’s downtown Dorchester Square. The statue was a reproduction of the one which stands in Ayr, near Burns’ birthplace. Its erection was not only in honour of Burn’s genius, but also to commemorate the impact of Scots on Montreal’s development. The speeches made that day emphasised that point. Burns was a symbol of Scottish identity in 1930s Montreal. The utilization of Burns as such was not a sudden thing. It evolved over the nineteenth century, competing with other symbols of Caledonia within Montreal ‘s Scottish community for pre-eminence. This study will trace the development of Montreal’s Scottish community through its public celebrations, commemorations and voluntary associations, and their use of Robert Burns within them. It begins in 1801, the date of the first Burns’ supper in Edinburgh, and ends in 1875. These public events and institutions featured in the city’s English-language press, and reflect the changes in Scottish identity, and their representations over these seventy-four years. Figure 2: Population of Montreal by Place of Birth. Scots have never been a large percentage of Montreal’s population, averaging between six and ten percent in the period under discussion. This chart shows that while the English-speaking population were the majority of the city’s population between 1832 and 1871, as a national group, French Canadians were always the majority. Among the Anglophone groups in the city the largest national group were the Irish, who numbered between eighteen and twenty-five percent of the population. A lot of the historiography dwells on the over-representation of Scots among the city’s political and economic elite. And while this is true, it does not mean that all Scots operated in this group. The vast majority of Montreal’s Scots occupied the less rarefied air of the middle and working classes. In 1807, the Montreal Curling Club was founded. It was at its heart a national association which, until about 1820, limited its membership to those of Scottish origin. Curling was not only a pleasant way to spend a frozen afternoon in the great outdoors, but a means of promoting Scottish identity. The events not only utilised the curling itself, but also other symbols of Scotland, particularly bagpipes. The English were the first to use their patron saint, George, in 1808. They held an elaborate dinner which lasted a full day, and utilised St. George excessively as decoration, on the food, walls and in the toasts. Other groups followed suit. till after five. . .
St. Andrew’s Day was not celebrated regularly until the 1830s. When it was celebrated in the 1820s it was in various ways, balls, dinners and sometimes both. In 1825, the Theatre Royal produced the play “Wallace” and illuminating the building with a large transparency of the patron saint. The St. Andrew’s Society was formed in late January 1835, following in the footsteps of the St. Patrick’s Society and the St. George’s Society. The German Society came soon afterwards. These societies institutionalised the celebration of saints’ days, and regularized the way in which they were celebrated. A parade and church service were added to the day, employing the same forms of celebration that the Irish had been using since 1824. But what of Robert Burns? He appeared in accounts of St. Andrew’s Day as the subject of toasts. In 1820 he was number of 18 of 19 toasts: “The Memory of Robert Burns, our Rustic Bard.” Often though, he shared the honours with Sit Walter Scott, but was also known to accompany Wallace, Bruce, Knox, and Ferguson. “Auld Lang Syne” was often sung at the dinners too. In 1840 a number of St. Andrew’s Society members came together and purchased a bible which had been reputedly given to Highland Mary by Burns in 1786. They promptly donated to Burns’ birthplace in Ayr. Burns was obviously not out of the consciousness of Montreal’s Scots, but was second fiddle to the patron saint. By the 1840s, Montreal’s population had grown enormously, providing the labour for its rapidly industrializing economy. The city’s associational life had expenaded to accomadate these new residents. The St. Andrew’s Society was joined by the Caledonian Society in 1855, and the Thistle Society in 1857. These Scottish societies joined the St. Andrew’s Society in celebrating the saint, in their parades, services and dinner. In 1851, Robert Burns’ birthday was celebrated for the first time in Montreal. Not by any of the previously mentioned Scottish societies, but by the Caledonian Curling Club, founded the previous year. The date was chosen for the club’s annual dinner of beef and greens. They chose the date because it was Burn’s birthday. The club members toasted Burns that year. In subsequent years, the Caledonian Curling Club continued to use the same date, but ceased to toast Burns. The centennial of Burns’ birth in 1859 marked a more concerted effort on the part of Montreal’s Scots to use Burns as a rallying point for their community. The Burns Club, a specially formed committee, organised a banquet at the City’s Concert Hall. Close to a thousand men and women paid 6 shillings to dine, hear speeches, sing and toast Burns, in an elaborately decorated room. Figure 3: Montreal Witness, 21 January 1859. Three days later, in the same venue, an unknown number paid 25 cents for a promenade concert and ball, hosted by the Thistle Society. 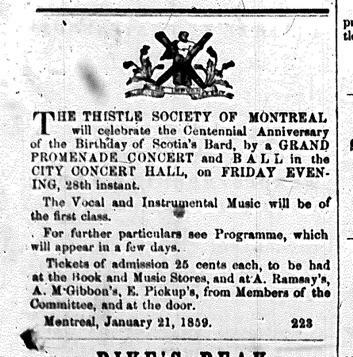 The Thistle Society continued to host a promenade concert and ball on Burns’ birthday until 1862. 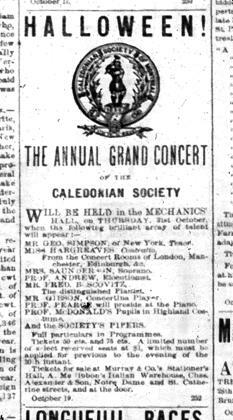 The Caledonian Society took over the day in 1869. Instead of concerts, which attracted large mixed crowds, they male-only dinners with smaller numbers of attendees. It would be a mistake to think that Scots’ celebrations in Montreal were limited to these two days. Montreal Scots adapted their celebrations to local needs. They used Burns’ poem “Halloween” as inspiration for another commemoration. October 31st was considered a traditional celebration in Celtic cultures, but had not been mentioned in Montreal in any way until 1860, when the Caledonian Society decided to host a “Grand Scottish Entertainment.” They were, at this date, already responsible for the Highland Games, held every summer, but had no winter gatherings. Figure 4: Montreal Witness, 19 October 1860. The program included Scottish ballads and instrument solos, lectures on Burns, and from 1886 on, prize poems. The event attracted around 2000 spectators each year. All the celebrations that I have presented expressed a Scottish identity formed from their experiences in Montreal. In Halloween there was a clear connection between old world and new. Speeches, like the excerpt below, and the prize poems like “Canadian Patriotic Song,” emphasised both their Scottish roots and their Canadian lives. with gratitude and affection Canada our home. There came to be three specific days in which Scots in Montreal could express their identities publicly: Burns Night, Halloween and St. Andrew’s Day. Of the three, two were associated specifically with Robert Burns. As the Pilot stated in 1861, above, Burns was a popular figure, who lent himself to the elite and non, alike. The elites used Burns night, while the others used Halloween to express Scottishness. Burns had graduated from a symbolic toast to the central figure in the community’s celebrational life.